Dendrites – The branched projections of a neuron that act to conduct the electrochemical stimulation received from other neural cells to the cell body, or soma, of the neuron from which the dendrites project. They are what receive the input to the neurone. Axon – The slender projection of a nerve cell, or neuron, which conducts electrical impulses away from the neuron’s cell body or soma. They are responsible for sending neurone output to the connecting CNS areas. Axon Hillock – Connects the cell body (the soma) to the axon. This is where action potentials are generated. Myelin Sheath – An electrically insulating material that typically forms a layer around the axon of a neuron. They are able to increase the speed at which action potentials are propagated. Mitochondria – Provide the neurone with chemical energy from respiration. Endoplasmic Reticulum (ER) – Synthesise proteins within the soma. Golgi apparatus – Processes proteins formed by the ER to make them functional, this often includes the process of glycosylation which helps in proper folding of proteins, stability and cell to cell adhesion. Nissl Substance ­- Large granular bodies found in neurons which contain RNA involved in the production of proteins. Microfilaments – The thinnest (actin) filaments of the cytoskeleton found in the cytoplasm of all eukaryotic cells. Neurofilaments – Intermediate sized, protein filaments found specifically in neurons. Microtubules – Microtubules serve as thick, structural components within cells which are also involved in transport. The axon and the dendrites of a neurone are too slender and transparent to be seen with normal staining techniques. Golgi’s method stains a limited number of cells at random in their entirety. (The mechanism is still not entirely known). Dendrites, as well as the cell soma, are clearly stained in brown and black and can be followed along their entire length. Enabling the tracking of connections between neurons and making the complex networking structure of many parts of the brain and spinal cord visible. The Nissl stain uses basic aniline to stain RNA blue, and is used to highlight important structural features of neurons. The Nissl substance (rough endoplasmic reticulum) appears dark blue due to the staining of ribosomal RNA, giving the cytoplasm a mottled appearance. Individual granules of extranuclear RNA are named Nissl granules (ribosomes). DNA present in the nucleus stains a similar colour. The cell bodies and proximal dendrites may also be observed. A staining solution of ferric chloride and haematoxylin; myelin stains deep blue, degenerated portions light yellow. This allows the tracking of myelinated fibres. Immunohistochemical staining involves the use of fluorescent substances to locate specific antigens. A fluorescent ‘tag’ is attached to an antibody, this antibody is then either; directly released onto a substance where it binds to its specific antigen or, an initial antibody binds to the antigen being probed for and the fluorescently tagged antibody then binds to the initial antibody. Once the antibodies have bound to the antigen, the specific antigen being probed for will then appear to fluoresce under specific light. Much more powerful than light microscopes, electron microscopes can magnify up to 1,000,000 times. This enables neurone structure to be viewed in very fine detail. 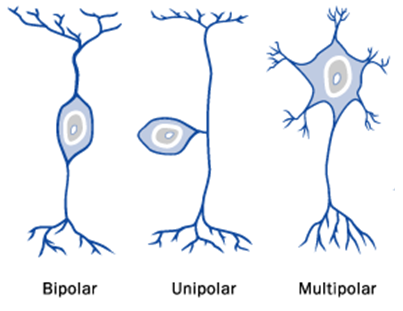 (Pseudo) Unipolar – Although there appear to be two ends to the unipolar neurone, (such as that observed in the bipolar neurone) there is originally only one exit from the soma, hence the pseudo- often prefixing unipolar. Many types of primary sensory neurones are unipolar. Multipolar – Multipolar neurons constitute the majority of neurons in the brain and include motor neurones and interneurones. Glial cells are non-neuronal cells that maintain homeostasis, form myelin, and provide support and protection for the brain’s neurons. The four main functions of glial cells are to surround neurons and hold them in place, to supply nutrients and oxygen to neurons, to insulate one neuron from another, and to destroy pathogens and remove dead neurons. 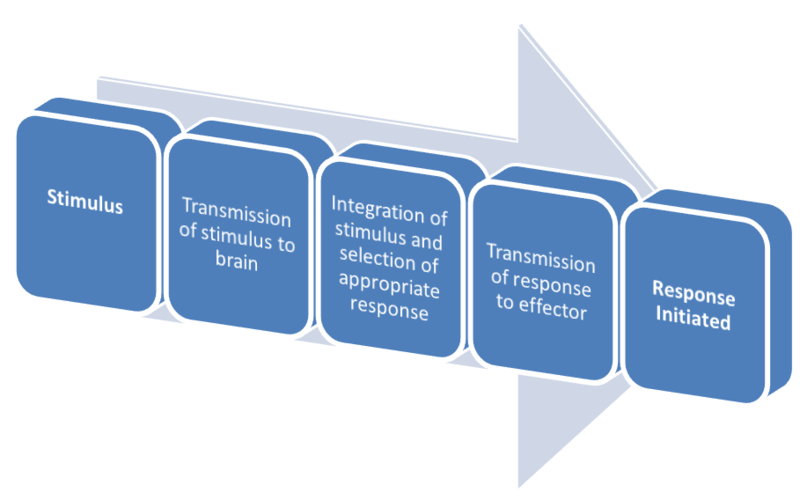 They also modulate neurotransmission. Astrocytes are star-shaped glial cells in the brain and spinal cord. 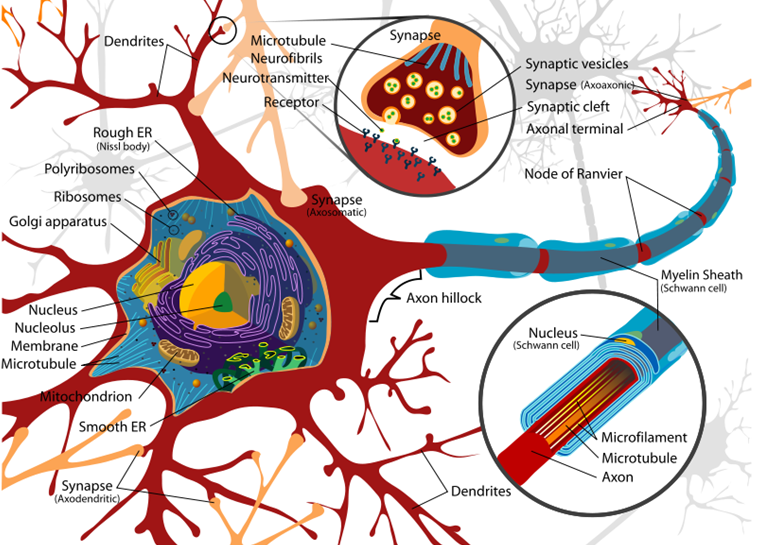 They perform many functions, including biochemical support of endothelial cells which form the blood-brain barrier, provision of nutrients to the nervous tissue, maintenance of extracellular ion balance, and a principal role in the repair and scarring process of the brain and spinal cord following traumatic injuries. It is thought that astrocytes are able to take up glucose from blood vessels and redistribute it to neurones, giving them the nutritional support they require. They can also take up neurotransmitters and ‘detoxify’ them. Microglia are a type of glial cells that are the resident macrophages of the brain and spinal cord, and thus act as the first and main form of active immune defence in the central nervous system (CNS). Microglia are constantly excavating the CNS for damaged neurons, plaques, and infectious agents. The brain and spinal cord are separated from the rest of the body by the blood-brain barrier, which prevents most infections from reaching the vulnerable nervous tissue. In the case where infectious agents are directly introduced to the brain or cross the blood-brain barrier, microglial cells must react quickly to decrease inflammation and destroy the infectious agents before they damage the sensitive neural tissue. Due to the unavailability of antibodies from the rest of the body (few antibodies cross the blood brain barrier due to their large size), microglia must be able to recognize foreign bodies, swallow them, and act as antigen-presenting cells activating T-cells. Since this process must be done quickly to prevent potentially fatal damage, microglia are extremely sensitive to even small pathological changes in the CNS. Ependymal cells are epithelial cells that line the cerebrospinal fluid (CSF)-filled ventricles in the brain and the central canal of the spinal cord. Their apical surfaces are covered in a layer of cilia, which circulate CSF around the central nervous system. Their apical surfaces are also covered with microvilli, which absorb CSF. Ependymal cells can also produce CSF. What are the CNS areas that you discuss under your description of the axon? Re-reading that part, I’d agree it sounds a bit vague. I think all I meant there was that the axons propagate action potentials to the next neuronal cell. This would be achieved by synaptic transmission of the action potential when reaching the axon terminal. Hope that helps!